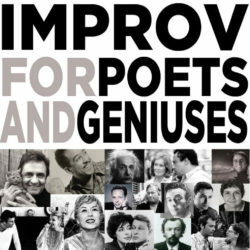 Directed by Shannon Manning, who studied with the legendary Del Close, the Improv for Poets and Geniuses workshop is based on the premise that improv can be done by anyone, and that anyone can benefit from improv. Artists, musicians, sculptors, DJs, fashionistas, political activists, lawyers, writers — improv can be a useful tool for any creative profession. This isn’t just a toolbox to make the ha has, it’s using improv to help develop what you are already doing, who you already are, to wear down the fear that is standing in the way from you making your next move. And it CAN BE funny ha has. Because that’s important, too. This workshop will help you be more YOU, on stage, and off, whether you have never done improv before or are on top of your game. Also it will help you be whoever else you might want to be. This is a DROP-IN class with all levels. You are neither too advanced nor too beginner for this adventure. For beginners you will be given some simple tools and you will learn by doing, right away. For more advanced students you will tap into the basics to develop more honesty and meaning in their work. If you have seen Beauty Love Truth you will know what we mean. It is performed by talented musicians, actors, and improvisers just being themselves with a bit of structure. They listen and respond and add, celebrate one another and create something new. The fact that it is improvised becomes beside the point. YOU MUST sign up for mailing list to introduce yourself and reserve your spot! A secondary mission of this workshop is to foster artistic connections between my artistic friends, to build community. Improv is a great tool for getting others to know what you are about and whether they want to work with you, in any field. Most days people will hang out a bit afterwards. If you feel like it, bring something that you are working on that you would like to share with others. Unfinisheder the better. A song, some writing, something you can show. We’re gonna try something cool. NO PREPARATION NEEDED, but if you want to check out the tab above, improv 101, you’ll get some background. What date do you want to attend workshop?